Module 1 - You are required to complete a series of manoeuvres both at slow speeds (e.g. U-turn) and faster speeds (e.g. avoidance manoeuvre at 50km/h), requiring competent handling skills. 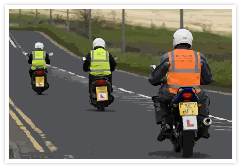 This course enables individuals to ride a 125cc motorcycle (power output does not exceeding 14.6bhp) without displaying 'L' plates and to carry a passenger. 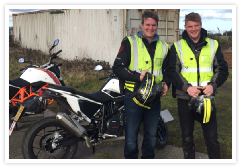 Module 2 - This test involves a 40-minute road ride, following a sight test and initial brief from the examiner. Once you have passed both these modules, you will obtain a full category A1 licence. Be 17 years of age or above. Hold either a full car or provisional motorcycle licence. Hold a valid CBT certificate. 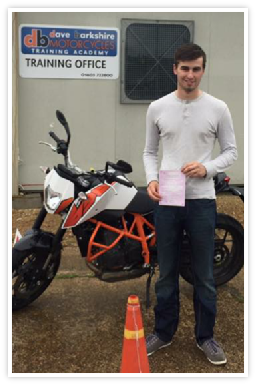 The practical test is in two parts, both of which you have to pass in order to qualify for the licence. 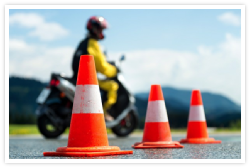 To attend this course you must be at least 16 years of age and ride a moped or scooter of up to 50cc, speed range 25 to 45 km/h. (click here for details) a theory test and a practical test.